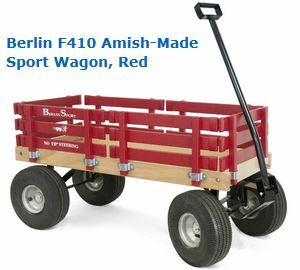 Berlin – Berlin F-410 Amish Wagon. 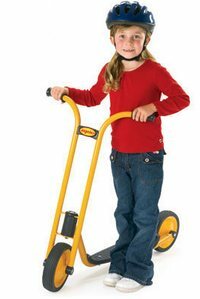 No tip steering, varnished wood beds, 10″ pneumatic tires, 300lb weight capacity. All steel steering and hardware. Hardwood rails with easy removal. Non-toxic paint, Made in America. Angeles – Angeles Scooter. Yellow powder coated steel frame. Lifetime service and replacement parts. Durable welded frame. Solid tires on steel rims with self lubricating nylon bearings. Ages 4-8. 5 year warranty. USA. 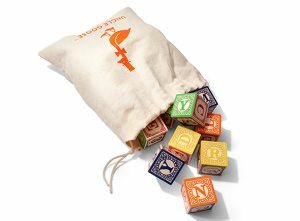 Uncle Goose – Wooden ABC Blocks with Bag. Handcrafted blocks from basswood. Made in Michigan. 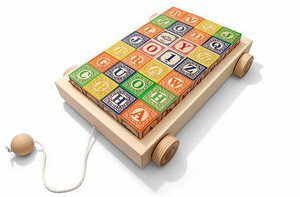 Child safe non-toxic inks, carved letters, scroll borders. Blocks fit inside included cotton canvas drawstring bag. Step2 – Push Around Buggy 10th Anniversary. 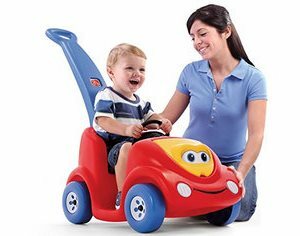 Character buggy for pushing and riding. Store snacks and toys under the hood. 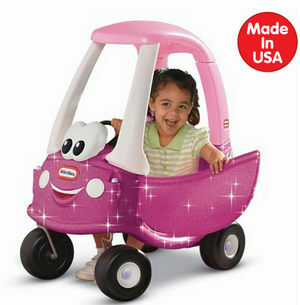 Includes safety seatbelt. Wipes clean easily, built to last. 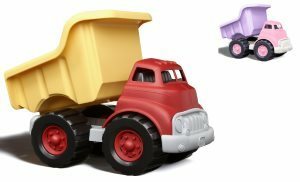 Uncle Goose – Classic ABC Blocks with Pull Wagon 28pcs. Decorated with scroll borders and ink drawings. Includes the pull toy wagon. Ages 2yrs and up. 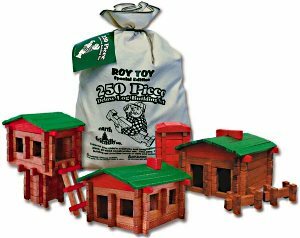 Roy Toy – 250pc Deluxe Log Building Set. All real pine wooden pieces, natural vegetable based food dyes. Made in USA. Comes with storage bag. BoomWhackers – Boomophone Whack Pack. 8 Tuned percussion tubes. C Maj scale. 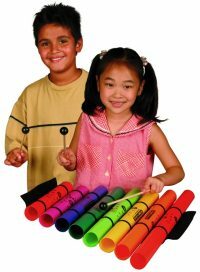 Comes with 8 note Diatonic set of Boomwhackers, tube holder, 2 mallets, and songbook with 20 children’s songs. 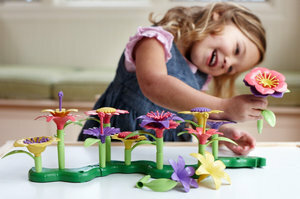 Green Toys – Build-a-Bouquet Floral Arrangement Playset . Includes 4 flower bases, 16 stems and leaf pieces, and 24 interchangeable flowers. Kids can create a variety of floral arrangements. Comes with storage box. USA. Step2 – Little Helper’s Doll Stroller. 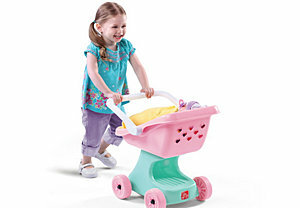 Great for early walkers to push with their favorite toys and dolls inside the stroller. Molded wheels won’t scratch floors. Durable molded construction wipes clean easily. 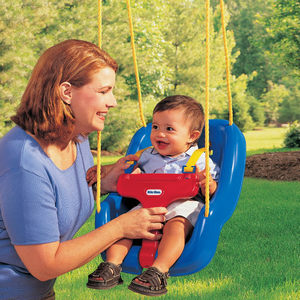 Great for pretend play. USA. 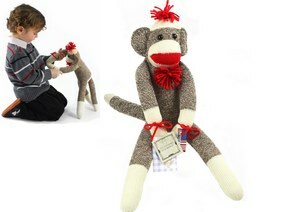 Ozark Mountain Kids – Original Sock Monkey stuffed animal. Button eyes. Made from work socks with red heels. 19″ tall. Made in USA. Ages 3 and up. Tim Mee Army Men – An American classic toy. Set of 100 piece toy soldiers. 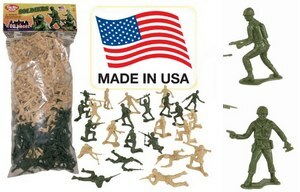 2″ plastic soldiers, 50 green and 50 tan figures. Minesweeper, bazookaman, radio operator, kneeling rifleman, office with binoculars, bayonet fighter, 60mm mortar, flame thrower, machine gunner. USA. Step2 Table and Chairs Set – One table and two chairs. 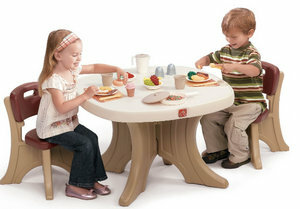 Can be used as an eating table, craft table, art table, more. 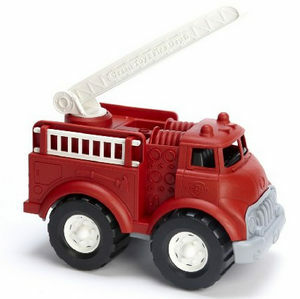 Sturdy poly construction that lasts and is easy to clean. Made in America. 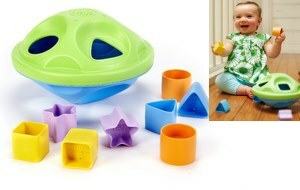 Green Toys Shape Sorter Baby Toy – Lightweight shapes are just the right size for little hands to grasp. Great for practicing fine motor skills and color matching. No sharp edges or small parts. 2 stars, 2 circles, 2 squares, and 2 triangles with shaper sorter. No BPA, PVC, Phthalates, or coatings. 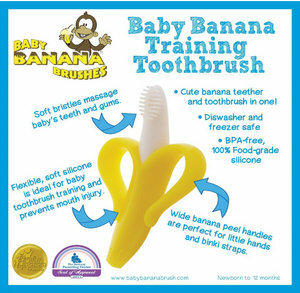 Safe for teething babies. Dishwasher safe. Made in USA. 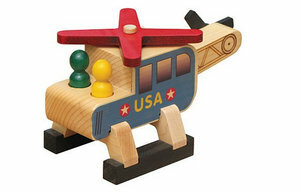 Classic Helicopter – Toy Chopper with propeller and rotor that spin. 2 removable wooden people. Crafted in the United States from New England pine and hardwoods. No-toxic finish. About 8 1/2″ long. Made in USA.